Heeding warnings of Hurricane Sandy’s impending arrival in Massachusetts, we battened down the hatches as much as possible. I carried outdoor chairs into the basement, watering cans into the garage, and cushions into the attic. Bill dealt with heavier items, turning over the picnic table and benches. We waited anxiously, aware of the wind picking up steam, watching leaves swirling on the ground and trees swaying to and fro. Standing inside Harmony Center, I gazed through glass windows at the rock cairns outside. They looked like sentinels standing guard around the building. I felt them offering strength and protection, along with an ability to ground swirling energy. I found their demeanor reassuring. I sent prayers to the trees, asking them to hold on tight with their roots, release their leaves and allow the wind to flow freely through their branches. Focusing on Sandy, I sent peaceful loving energy her way. I asked her to be gentle, to let go of anger, and to be kind to all the innocent beings in her path. I apologized to Gaia, our planet Earth, for all the abuse we humans have wrought – for the ways we’ve taken her for granted while polluting her sacred waters, air and earth. I begged for her forgiveness. As Sandy neared the east coast, I went for a walk in the woods. Watching the trees bend and sway, I asked them to hang in there, to go with the flowing wind, not fight it. Arriving in an area I consider sacred, I sent more prayers to Sandy, to trees, to all of Earth’s elements. I fervently hoped that life would be spared. Wind howled, rain fell, and so did some trees. We were fortunate, for the trees along our driveway and around the buildings withstood the storm quite well. They released some branches and leaves, but avoided hitting the power line and buildings. Yes, we lost power for a while, but not for too long. Others were not as fortunate. Ocean water rose up, flooding areas of New Jersey and New York. Raging wind fueled fires and devastated communities. After the wind calmed and rain abated, I prayed for healing. 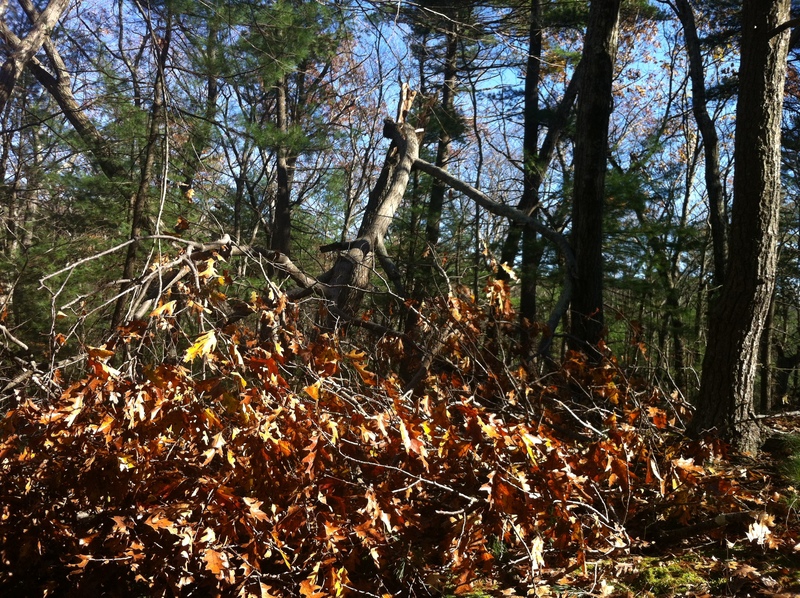 On subsequent walks in the woods, I observed Sandy’s damage and wondered about the message. What can we learn? I notice that oak trees sustained the most damage, especially those with leaves still attached. Their roots held firm, but their trunk snapped. Mulling this over, I infer that these trees were too rigid. Rather than bend in the breeze, they stood straight and tall. I take this as a lesson – there is strength in flexibility. Looking at fallen boughs resplendent with brown leaves, I wonder why these particular oaks held on so tightly to their leaves. They wouldn’t let go. If they had, perhaps the wind would have flowed through their branches more easily. Knowing the difficulty I have parting with clothes I rarely wear, I recognize another lesson. I must learn to let go, to release what no longer serves me. Taking this insight further, I recognize the freedom that comes with paring down one’s life. If I let go of irrelevant stuff – whether material possessions, compulsive behaviors or distracting thoughts – I can then focus more fully on what is truly important, more relevant to life. Most importantly, Sandy sent a message from our planet. We humans need to shift our relationship with Earth. We need to recognize that we depend on her for every aspect of our lives: for the food we eat, the water we drink, the air we breathe. Instead of abusing her, we need to value her, protect her, care for her. We must end global warming. Let us heed Sandy’s warnings and learn her lessons. The time is now. It is up to us!